Sum 41 hit worldwide radar in 1996 after tiny Ajax, Ontario, proved unable to fully contain the foursome’s blathering mixture of punk-pop riffing, hip-hop poses, and toilet-bowl humor. Led by guitarist/vocalist Deryck Whibley, who looked like a mash-up of the Prodigy’s Keith Flint and cartoon land’s Calvin, the band also included guitarist/vocalist Dave Baksh, bassist Cone McCaslin, and drummer Steve Jocz. 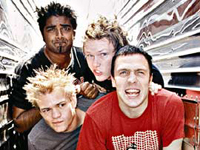 Wooed by the boys’ goofy antics and incendiary live show (and excited about the prospect of promoting their very own blink-182), Island put Sum 41 on the payroll in 1999. The Half Hour of Power EP followed, and Warped Tour dates got the word out. They returned in 2000 with the fun-filled full-length All Killer No Filler, and the singles “In Too Deep” and “Fat Lip” became staples of both modern rock radio and Total Request Live. An extensive tour followed, and Sum 41 enjoyed their boffo success the way all near-teenage boys would, with plenty of towel-snapping, groupie-loving, and self-depreciating, low-ball humor. In 2002, they returned to wax with Does This Look Infected? While the album was a bit harder-edged, it found the band just as jazzed as ever to mix punk-pop business with sophomoric pleasure: the video for “Hell Song” featured the fellas acting out a sort of rock star debauchery cage match with the aid of a few celebrity action figures. Metallica, Jesus Christ, and the Osbournes all made appearances in the hilarious clip.